Great location!! Very helpful, friendly staff!! The apartment was clean and comfortable and had everything we needed. Large apartment, centrally located, friendly helpful hosts, clean, easy, had an elevator, updated. Would highly recommend. Exceeded expectations. The location was beyond amazing. We were close to many attractions, dining and transportation. The ease of communication and the quality of the accommodations in relation to the price make this my new favorite place to stay in Paris. Location and price. The host, Alejandra was responsive, friendly and very helpful. I loved the location! It was so quiet at night yet incredibly easy to get to places. Great location, quiet, clean. Very centrally located. Great location. Close to metro stations, just a few minutes walk to the Louvre. Cute cafes on the street. Quite and safe. Helpful staff. Will definitely go back! The location was perfect! We had the Deluxe Suite which was great for 6 people. Two porches for us to enjoy with patio seating. Perfect for breakfast or evening wine sipping. Easy walk to the Louvre and other popular museums and parks. Great restaurants on the same street, and a few bakeries to choose from too. Super fun time in Paris! We will definitely stay there again. 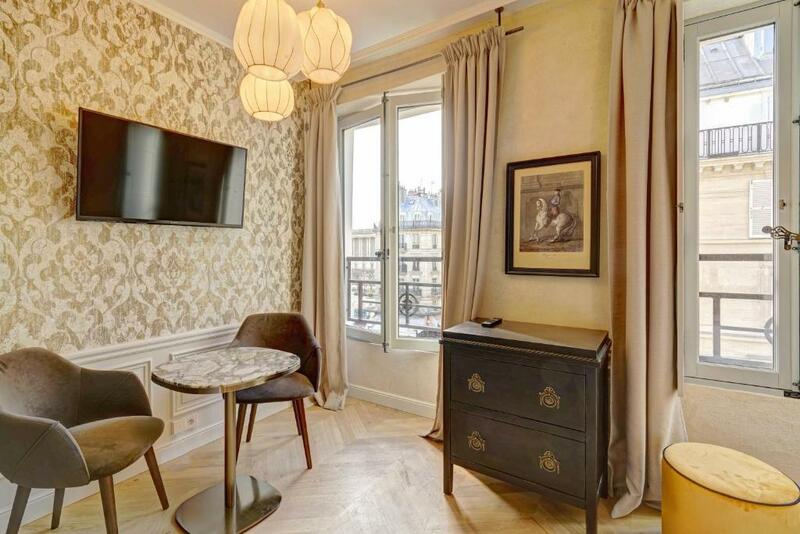 Lock in a great price for Apartments Du Louvre – rated 9.1 by recent guests! Set in a quiet street in Les Halles, Apartments Du Louver offers self-catering accommodations with central air conditioning, a elevator, free Wi-Fi access throughout, and a daily maid service is available with a supplement. 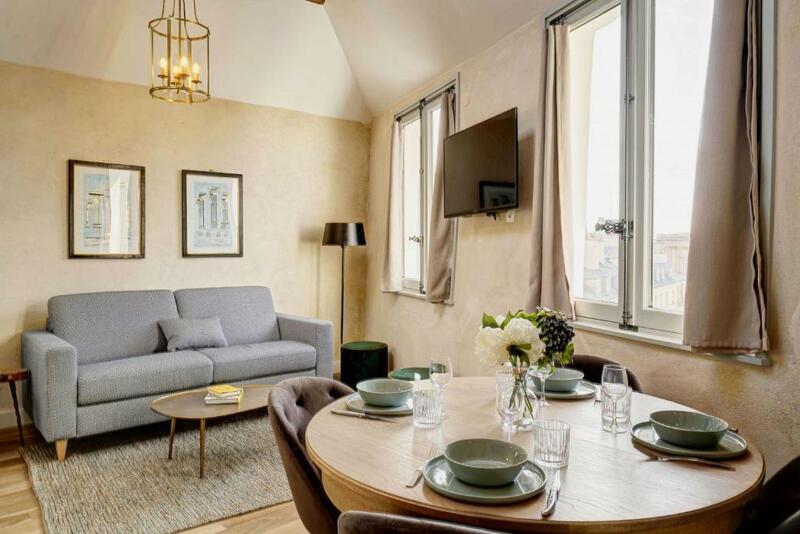 The air-conditioned apartments at Apartments Du Louver feature a flat-screen TV with satellite channels, a seating area, a washing machine and ironing facilities. The bathrooms are complete with a shower and hairdryer. Bed linen and towels are provided. 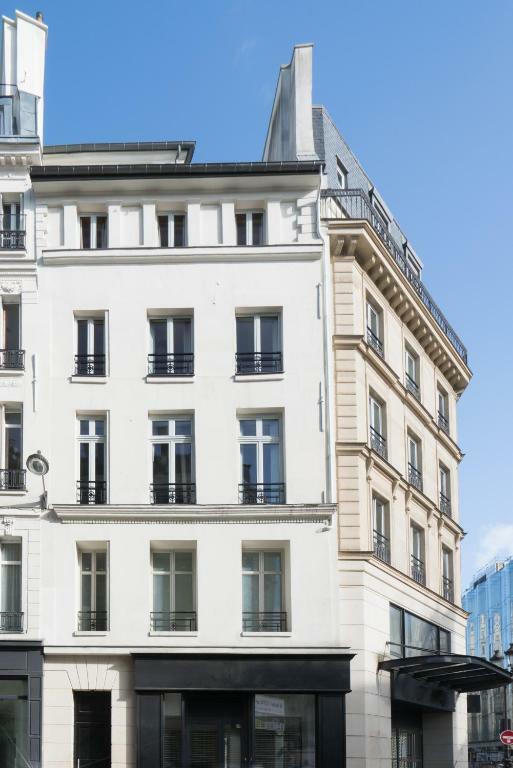 Apartments Du Louver is 1,950 feet from the Louver Museum, and Metro line 1 is a 2-minute walk away and provides direct access to the Champs-Élysées district. 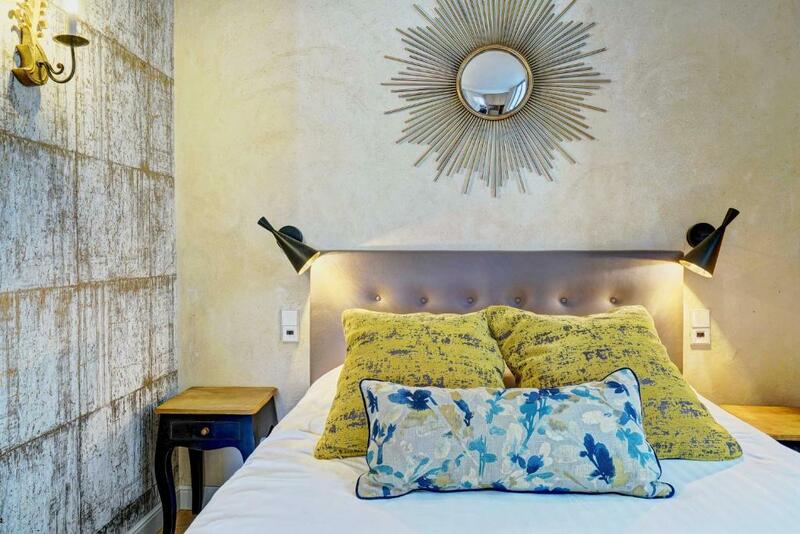 When would you like to stay at Apartments Du Louvre? On the top floor, this 2-bedroom apartment is more spacious and is set over 2 levels. It has 2 balconies and an open-plan kitchen. 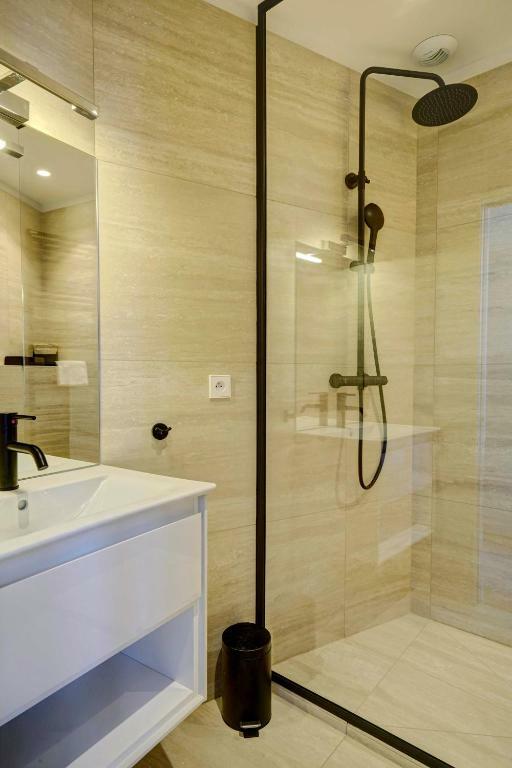 Set over 2 levels, this 1-bedroom apartment has modern-style décor, a full kitchen and 2 bathrooms. This 1-bedroom apartment has an open-plan kitchenette, a living room with satellite TV and bedroom with street views. This apartment features a dishwasher, washing machine and kitchenware. This apartment has a kitchenware, dishwasher and electric kettle. This apartment features a toaster, view and satellite TV. House Rules Apartments Du Louvre takes special requests – add in the next step! 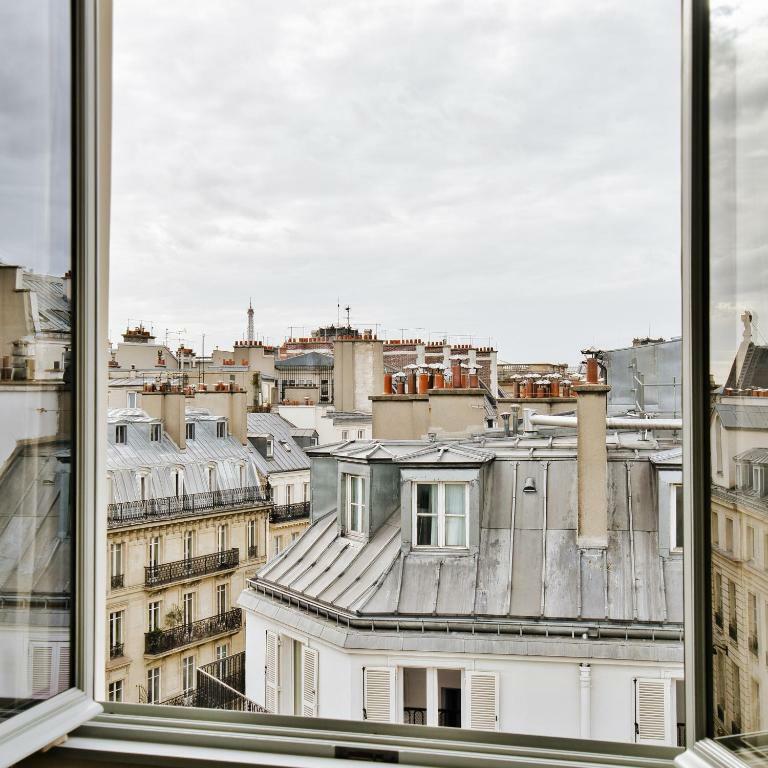 Apartments Du Louvre accepts these cards and reserves the right to temporarily hold an amount prior to arrival. Daily housekeeping is optional, at an extra cost of EUR 20 to EUR 30 per night depending on the apartment. Please note that Apartments Du Louver features 1 baby cot, which is available upon request. Please inform Apartments Du Louvre of your expected arrival time in advance. You can use the Special Requests box when booking, or contact the property directly using the contact details in your confirmation. We were there right as the season changed, so the apartment was warm until they turned the air on. The water pressure for hot water was low. Well equipped and comfortable apartment in a great location. When we realised they had forgotten to provide us pillowcases, it was Saturday night. They do not work nights and Sundays, so this meant no pillowcases for 2 nights. Not ideal. Also, not sure if it's like this throughout Paris, but the water pressure was low in the shower. Staff are friendly and speak English. Location was great. Walking distance to the louvre, notre dame and other things like supermarkets, restaurants and shops. Had a small lift, so no need to carry our luggages up any stairs. Apartment also had everything we needed like a small kitchen and clothes horse to dry our clothes from the washing machine. Beds comfy, nice bathrooms and great to have washing machine in the room. Bath had no plug.., some light bulbs not working, lights at the cooking filter for the stove not working. There was nothing that stands out to me to as disappointing. Excellent Location easy to go anywhere in Paris. Comfortable with facility in room. Safety in good location and Key card lock. The reception opens only at 10.00, during the weekend we could not take towels for our kid as the cleaning lady does not speak English. The location is perfect, a lot of restaurants and cafes nearby, small shop with food and drinks just in front across the street, the facility contains everything one needs for a short stay. Lovely comfortable beds, nice quiet apartment, very well equipped including a washing machine and a great selection of kitchen utensils. Warm and informative welcome. Peaceful studio apartment with great privacy, reception open during day time hours. Ideal location, close to The Louvre and easy walking distance of Notre Dame. Great restaurants and cafes in the vicinity! Not the biggest or cheapest apartment (I was in the Studio) but given you are in VERY central Paris probably ok. View out of the window wasn’t very inspiring- a brick wall pretty much. 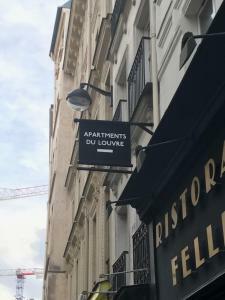 Perfect location-short walk to the majority of tourist Paris-Louvre, Opera, River Seine etc yet in a great little area with lots of cafes, bakers, restaurants, shops. There’s also a little supermarket straight across from the apartment open late. You can walk to everywhere -I’ve never used the Metro so little. Apartment was very clean and the check in very professional. There was reception through the day and a secure card access door in the evening/night. Had a general feeling of being very well organised. 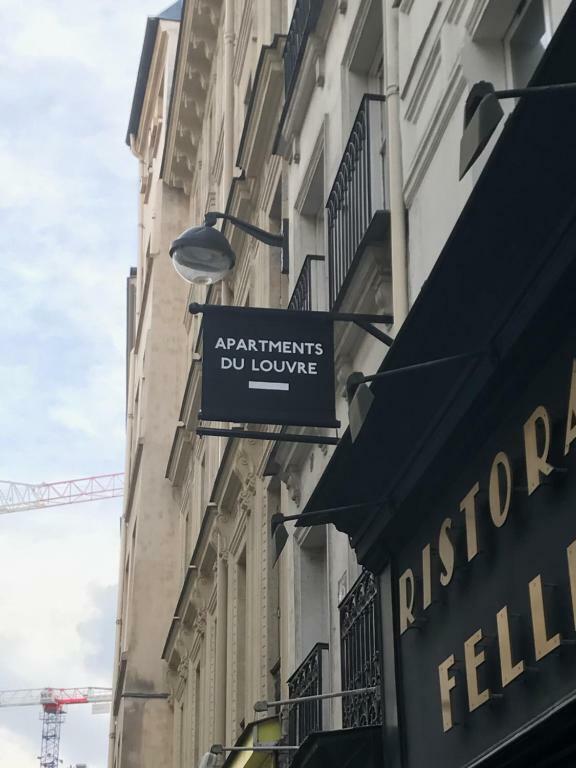 Fantastic location within walking of the beautiful louvre boulangerie,supermarket, multiple restaurants all within easy access. I would recommend these apartments highly we will be back. 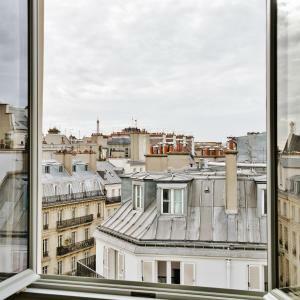 Great apartment in a very accessible part of Paris. Close to restaurants, attractions and transport. Good sized rooms. Two bathrooms very convenient with 3 adults. Very helpful hosts.